In 1917 America was just beginning its involvement in World War I, but a 38 year old Chicago businessman named Melvin Jones was thinking about more than the war when he challenged his local business group to “reach beyond business issues and address the betterment of their communities and the world.” Jones and his group decided to contact similar clubs around the country and hold a convention on June 7, 1917. At that convention the group adopted the name of one of the invited groups the “Association of Lions Clubs.” A few months later a constitution and by-laws were adopted and the Lions Club was born. Within three years the club had become international, and in 1925 Helen Keller urged the organization to become her Knights of the Blind, the cause the Lions are most known for today. Despite the focus on sight, Lions Clubs are free to adopt any non-political local cause or charity that helps to meet the needs of their community. By 1931 Easton was certainly a community in need because America was deep in the Great Depression. Bill Fenwick, stationmaster at the North Easton Depot, wanted to do something to help his town. He and his friends decided to call in the Gillette Brothers, paid fundraisers for the Lions Club, for a meeting at the Minnetonka Restaurant on September 16th. The Minnetonka was centrally located at the junction of Belmont and Washington Street, and it was hoped the meeting would attract men from all over town. At the time there were only six Lions Clubs in southeastern Massachusetts. The Gillette Brothers probably summed up the mission of the Lions with the club’s motto, “We Serve.” From the start the Lions have been a service organization not a fraternal, religious or political group. The club prefers no religion, yet it encourages every member to play a role in their church. The club doesn’t prefer one political group, but it encourages members to pursue their duties as citizens. Of course, the Gillette Brothers mentioned Helen Keller and becoming Knights of the Blind. Whatever the brothers said 21 men signed up as charter members. Sponsored by the Attleboro Lions, Easton received its charter on October 1, 1931 at the Minnetonka. The program opened with the singing of “America,” a song that still opens every Lions meeting. The club members decided to focus on three things: bettering education, improving public health, and fighting poverty. This decision should come as no surprise since four of the original members were either doctors or dentists, and three more were educators including the Superintendent of Schools and the Principal of Oliver Ames. Two other members owned restaurants and two were grocery owners so they were well aware of the food problems of Easton residents. 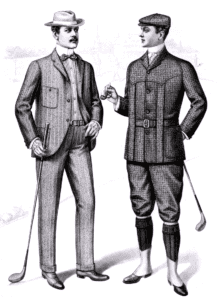 The founders of the club were all products of the Victorian era. The oldest member was Edgar E. Kelley born in 1860. His hardware store at 14 Center Street now houses the law offices of past Lions President Kevin McIntyre. The youngest member was 26-year-old Cornelius Harvey whose market was on the corner of Mechanic and Main Street. During the Great Depression Easton had a population of a little over 5,000 people. At Thanksgiving and Christmas the club donated over 80 holiday baskets to needy families. Since it’s inception 100% of money raised by the club have gone to fund service projects. Card parties and lecture programs, most held at Frothingham Memorial Hall and overseen by charter member Jack Mason, were the big fundraisers in the early days. Meetings were held in a variety of restaurants and halls, but the early Lions seemed to prefer catered meals-original charge $1 then as now supplemented by members’ dues and “penalties” charged by the “Tail Twister.” The women’s clubs and church groups that provided the meals benefited their own treasuries, another way that the Lions helped fight the Depression. Membership grew throughout the 1930s. In 1935 Herbert O’Neil became the first non-charter member to become “King Lion”, followed the next year by another new member Elmer C. Harrold. 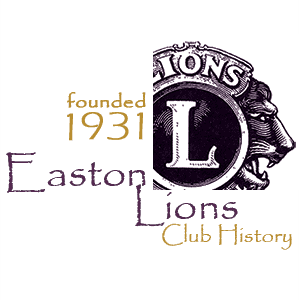 In 1932 Abraham Brooks joined the Lions and after decades of community service became the first Easton Lion to be a member for 50 years. Herbert O’Neill later become the first Easton Lion to serve as a District Governor. By the start of World War II, the Lions had 52 members. Half a dozen members were young enough to join the armed forces including David and Oliver Ames, and Clyde Craig. Club members avidly followed these soldiers and sailors as they served around the world, but the war also provided a strong call to service for the Lions on the home front. Regular meetings began to feature programs on topics of national interest like “Synthetic Rubber”, and “Things You Should Know About the Rationing System.” Charter member Dr. Jacob Brenner presented an important early lecture on “neurosis and other mental disturbances as it affects those in our Armed Forces who have been through front line action and have returned to the U.S. for treatment.” That is what we would today call PTSD, and it was a cutting edge topic in 1944. Rationing led to problems and creative solutions for the Club. Early in 1943 it was announced that gas rationing rules might define driving to Lions meetings as illegal “pleasure driving” leaving club members to get to meetings on foot. However, within two weeks the local ration board declared the Lions Club vital to the war effort and placed it in a special category with the Grange allowing members to drive to meetings although car-pooling was recommended. The war and the Ration Board challenged the Lions traditional food distribution as well. The Lions discovered that war work had so improved the economic landscape that only 20 Christmas baskets were needed in Easton. 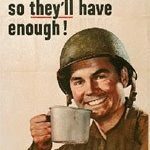 However, every recipient of a basket would have to give up ration points for any rationed food in the basket. Club members solved this problem by visiting every food store in Easton and getting the store owners to agree to honoring a Lions Club gift certificate so that the twenty families could chose to buy whatever food product they needed whether it was rationed or not. The Lions amply repaid the Ration Board’s designation through its war work. In 1942 club members raised $1,000 and sent 300 boxes to Easton soldiers overseas. 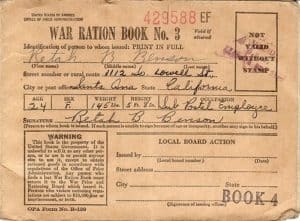 When the local Red Cross was charged with raising $7,000 in a war bond drive, five of the seven subcommittee chairs were Lions and the drive was oversubscribed by $1,000. One of the unique features of Easton during the war was an aviation observation post located in the attic of the old High School on Lincoln Street, one of the highest spots in town. Students under the supervision of some adults spotted training flights and phoned in reports. The Lions voted to improve the observation post although the first effort by Harry DeWitt caused a blackout when he cut into the wiring! Below the High School on the Rockery Green, the Lions erected and maintained the town honor roll listing all Easton’s service men and women. In a time of food rationing, the Lions combined their long term support of the town’s youth programs with a practical effort to boost home food production. In 1943 the Lion’s distributed 3,300 tomato plants to 70 boys and girls in the 4H Club. Seventeen members of the Lions donated additional funds so that 16 4-Hers could raise chickens. In October, the kids reported that the tomato plants produced 240 bushels of tomatoes that was turned into 2,214 jars of preserved tomatoes. The 17 members who had paid for the chickens got a free chicken pot pie dinner and a free chicken. Since meat was rationed, the hen’s eggs were worth their weight in gold.